We’ve been getting a lot of requests for something that isn’t sweet potatoes, but something equally sweet and healthy. Linda Engle of Engle Farms at the Murrieta Farmer’s Market to the rescue! 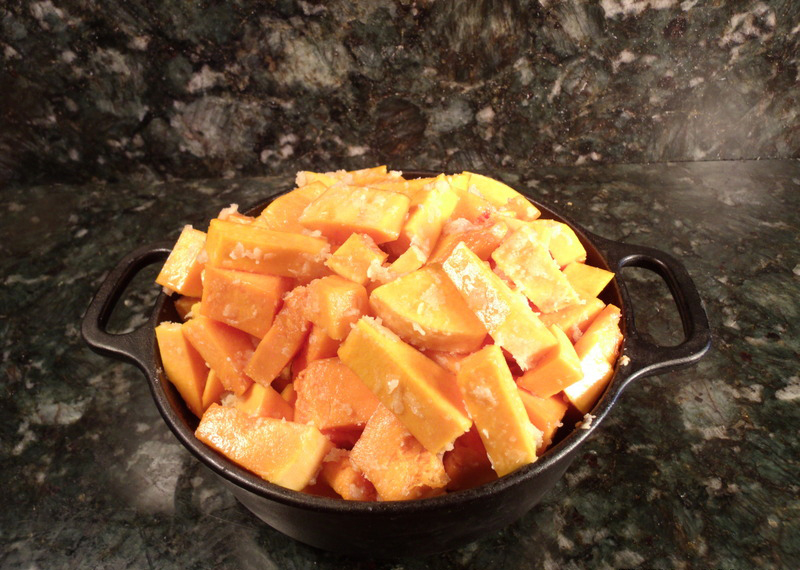 Butternut squash from Linda and the recipe she gave us looks a lot like sweet potatoes and candied perfectly. Now that we’ve discovered butternut squash we plan to use it in lots of recipes for a low carb substitution for potatoes. 2 Butternut squash, about 4lbs. Peel squash, remove seeds and cut into bite size pieces. 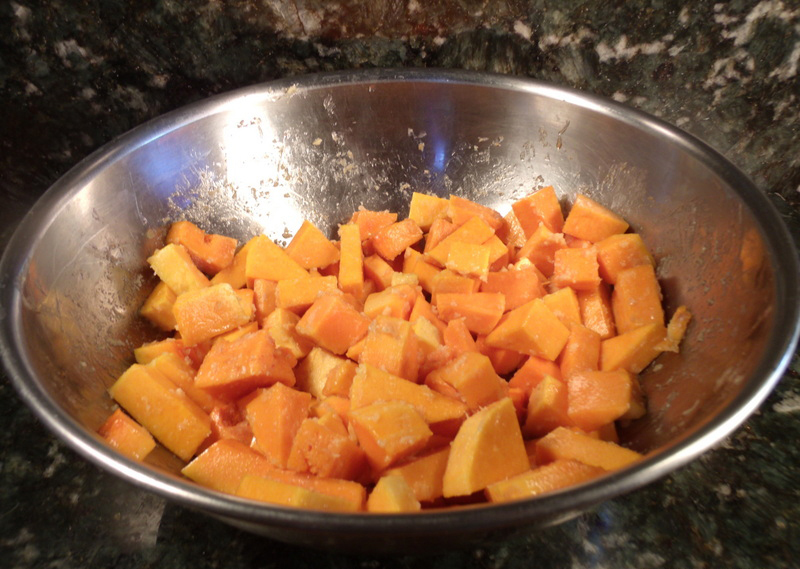 Blend squash and remaining ingredients in a medium size bowl. Pour squash mixture into lightly greased 2-3 quart cast iron Dutch oven for 60 minutes at 425 Degrees (218c) or until tender stiring every 15 minutes until tender. Cooking in the Green Mountain Grill is a snap. fill it up first with pellets to make sure you ready to grill. I like Lumberjack pellets because there are so many different kinds and low ash. (Easy clean up.) Preheat the oven to your desired temp. We cooked this for 60 minutes at 425 Degrees (218c). Note: I only use heavy cast iron or baking dishes here. We’ve been getting a lot of requests for something that isn’t sweet potatoes, but something equally sweet and healthy. Linda Engle of Engle Farms at the Murrieta Farmer’s Market to the rescue! Butternut squash from Linda and the recipe she gave us looks a lot like sweet potatoes and candied perfectly. Now that we’ve discovered butternut squash we plan to use it in lots of recipes for a low carb substitution for potatoes. Patti and I have set one night a week just for us. It’s our date night. We usually put something special on our Pacific Living Outdoor Oven but sometimes we cook inside. We always eat outside on our patio where it is very comfortable with a rainforest theme. Wood burning stove, little lights, candles, lanterns and surround sound. We enjoy a little wine, or strawberry margaritas using frozen strawberries for ice, good food, music and sometimes a dance or two… Candied Butternut Squash Outdoor Cooking Recipe Prep Time: 10 minutes Cook Time: 60 minutes at 425 Degrees (218c) or until tender Grill: Green Mountain Grills Pellet Grill Pellets: Lumberjack Maple Ingredients: 2 Butternut squash, about 4lbs. 3 Tablespoons pure maple syrup ½ stick butter, melted ¾ cup brown sugar 1 Tablespoon Brandy or Brandy extract Directions: Peel squash, remove seeds and cut into bite size pieces. 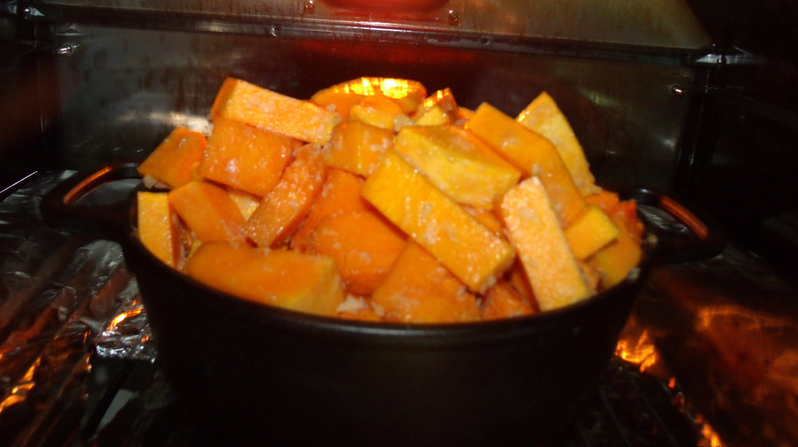 Blend squash and remaining ingredients in a medium size bowl. 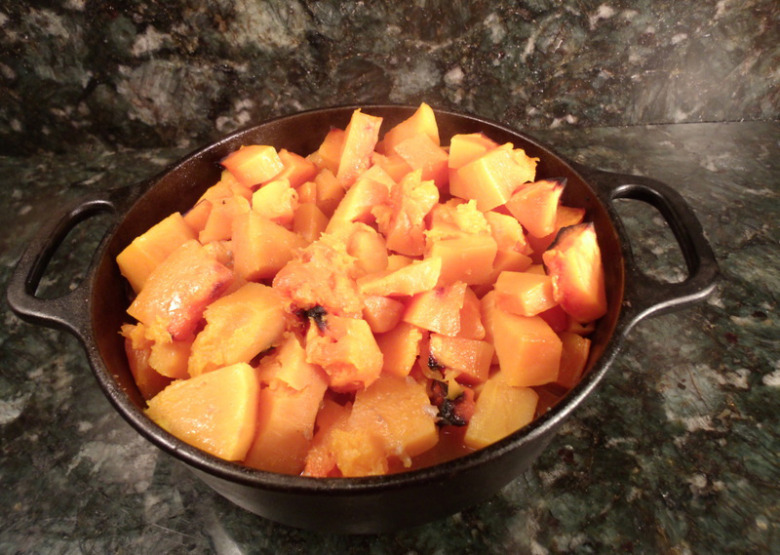 Pour squash mixture into lightly greased 2-3 quart cast iron Dutch oven for 60 minutes at 425 Degrees (218c) or until tender stiring every 15 minutes until tender. Blend Squash and Remaining Ingredients Ready for the Green Mountain Grill Cooking Directions: Green Mountain Grill Cooking in the Green Mountain Grill is a snap. fill it up first with pellets to make sure you ready to grill. I like Lumberjack pellets because there are so many different kinds and low ash. (Easy clean up.) Preheat the oven to your desired temp. We cooked this for 60 minutes at 425 Degrees (218c). Note: I only use heavy cast iron or baking dishes here. Let's Eat!!!! About our Recipes The important thing to keep in mind is TIME & TEMPERATURE. You can even do some of them in the oven or crock pot, but, then you lose all the flavors you get from cooking outdoors. But sometimes it does rain. Remember that a recipe is simply an outline; it is not written in stone. Don’t be afraid to make changes to suit your taste. Take it and run with it….